It is with a heavy heart that I post this announcement of the Bluebook’s 20th Edition Survey. A publication date has not yet been announced. If you will go the link for the Bluebook Online, (https://www.legalbluebook.com/), you will find its survey for suggestions. Do not forget the bonus prize! 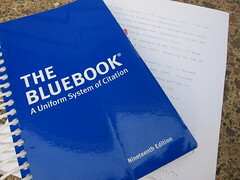 The editors of The Bluebook: A Uniform System of Citation need your help! This is an opportunity for you to share your ideas with us as we update The Bluebook for its Twentieth Edition so that we can target our revisions to best serve your needs. Please take a few minutes to fill out our survey at http://www.legalbluebook.com/survey. Surveys must be received by November 8, 2013 in order to be considered for the Twentieth Edition. As an added incentive for the completion of our survey, we will select 5 participants at random to receive a Kindle Paperwhite e-reader. An additional 20 participants will randomly selected to receive a free copy of the Twentieth Edition as well as a two-year subscription to The BlueBook Online. Winners will be notified by December 1, 2013. Provides detailed chart and other research resources. 292 P.3d 27, all Justices of the Oklahoma Supreme Court concurred in a per curium opinion that this legal issue is controlled by Planned Parenthood v. Casey, 505 U.S. 833 (1992). The challenged measure is facially unconstitutional pursuant to Casey, 505 U.S. 833. The mandate of Casey remains binding on this Court until and unless the United States Supreme Court holds to the contrary. The judgment of the trial court holding the enactment unconstitutional is affirmed and the measure is stricken in its entirety. ‘The vote by the European Parliament’s leading committee is a strong signal for Europe. It paves the way for a uniform and strong European data protection law that will cut costs for business and strengthen the protection of our citizens: one continent, one law,’ said Vice-President Viviane Reding, the EU’s Justice Commissioner. This is the second round of lay-offs for LexisNexis, which includes long-time Martindale-Hubbell employees. Thomson Reuters also announced Westlaw lay-offs earlier this month. Yes, You Can. No, You Can’t. The Latest Abortion Battle in Texas. ≈ Comments Off on Yes, You Can. No, You Can’t. The Latest Abortion Battle in Texas. But not so fast . . . .
≈ Comments Off on A Return to Civility? Another reason never to cite to Wikipedia as “fact” (if you still need one). ≈ Comments Off on Another reason never to cite to Wikipedia as “fact” (if you still need one). Named “The Best Legal Blogs of 2013” – so far. . . .
≈ Comments Off on Named “The Best Legal Blogs of 2013” – so far. . . . Although I think it is too soon to call it, these blogs have been named, to date, the top legal blogs for 2013. Some great blogs may be missing, but everything here deserves the title. There are many top-notch regional or special legal area blogs deserving of high recognition regardless of whether they make a national list. Even though the ABA will not announce its list of the top 100 blogs until later this year, my guess is that the majority listed below will no doubt will make the cut. Starting a new solo law practice? Avoid these seven deadly sins. ≈ Comments Off on Starting a new solo law practice? Avoid these seven deadly sins. Since 2000, national groups better known for influencing presidential and congressional elections turned their sights on judicial contests in several state judicial campaigns. ≈ Comments Off on Since 2000, national groups better known for influencing presidential and congressional elections turned their sights on judicial contests in several state judicial campaigns. ‘The New Politics of Judicial Elections, 2011-12: How New Waves of Special Interest Spending Raised the Stakes for Fair Courts.’ Justice at Stake, the Brennan Center for Justice at NYU School of Law, and the National Institute on Money in State Politics issued http://newpoliticsreport.org/ (access online in http://newpoliticsreport.org/report/2012-report/introduction/ or http://newpoliticsreport.org/content/uploads/JAS-NewPolitics2012-Online.pdf yesterday. Originally posted by Howard Bashman, on How Appealing Blog.